Castleton, VA (December 8) -The Barnes & Hampton Celtic Consort led by Linn Barnes and Allison Hampton, will transport the sounds of the holiday season, 4 p.m. Sunday, Dec. 20, at Castleton Theatre, 663 Castleton View Rd., Castleton, Va. They have performed at the Kennedy Center, Folger Library and Yale University receiving rave reviews. 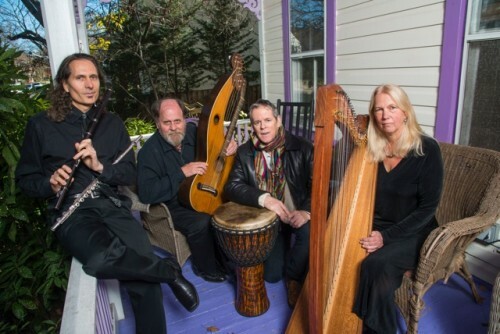 The four-person group includes percussionist Steve Bloom and Joseph Cunliffe on lute, guitar, mandolin and viola da gamba. Together they will perform Christmas and holiday music from Ireland, Galician Spain and Scotland, as well as traditional Irish tunes. Tickets range from $20 to $40. For more information or to reserve seats, call 866.974.0767 or go to www.CastletonFestival.org. Barnes and Hampton, described by The Washington Post as “a Washington institution,” have been making music together for 40 years. Their rare combination of styles and instrumentation appeals to a wide variety of audiences. While both shared an initial love of the lute, Hampton now focuses on Celtic harps, while Barnes, has added an assortment of steel stringed instruments, including the guitar, harp-guitar and citternas to his repertoire. In addition to 35 years with the acclaimed Dumbarton United Methodist Church Concert series for which they were the first performers, the duo has appeared at the Kennedy Center, the Folger Shakespearean Library and the Smithsonian Institution, and played at colleges and universities on the East Coast, including Yale, Georgetown, George Washington and The University of Virginia. They also have made five successful European concert tours. Barnes and Hampton recently released a new CD, titled “A Celtic Christmas,” on Oak Leaf records. The recording is a compilation of favorite pieces from the Dumbarton Concert Series. The two will be joined at Castleton by Joseph Cunliffe who plays a variety of wind instruments, including wooden and silver flutes of all sizes, as well as whistles and recorders. Cunliffe is one-half of the internationally recognized Flutar, a duo that has performed in such diverse venues as the Strathmore and the Mayan ruins at Sand Andres, El Salvador. Steve Bloom will round out the quartet. Bloom has played percussion professionally in thousands of performances in more than a dozen countries. His recordings include drumming in styles ranging from Middle Eastern and Persian, Cuban, Latin, Brazilian, Sephardic, Jazz, Blues, Gospel, New Age to Celtic. Castleton in Performance (CiP) is the original performing branch of the Castleton Festival. Originally operating under the umbrella of the Châteauville Foundation, CiP began in 1997, when the late Maestro Lorin Maazel began the mission of bringing the highest caliber of music to the Theatre House on Castleton Farms. In the nearly 20 years since, CiP has given audiences once in a lifetime multicultural experiences. This thematically diverse series of recitals, chamber music, jazz, world music, theatre, opera, and dance brings premier artists into the foothills of the rolling Blue Ridge Mountains. Eminent artists have included Mstislav Rostropovich, Yefim Bronfman, Itzhak Perlman, Chinese traditional soloists Wu Man and Ma Xiaohui, Emanuel Ax and modern and Indian dance companies. The July 1-31, 2016 Castleton Festival will include opera, symphonic concerts, jazz, bluegrass, chamber music, and vocal recitals. The Festival is distinct among other festivals because of its combined roles as a producing entity, and a mentoring program for young artists and theatre professionals through the Castleton Artists Training Seminar (CATS). This unparalleled seven-week program identifies exceptional young singers and instrumentalists and brings them to the next level of accomplishment through comprehensive training with leading professionals in their field, as a carefully developed career building process in a nurturing environment. To date, more than 300 young artists have benefited from the Festival’s CATS program. Visit www.CastletonFestival.org for a complete schedule and visitor information. Photo Cutline – Joseph Cunliffe, Linn Barnes, Steve Bloom and Allison Hampton will deliver the sounds of the season with Christmas and holiday music from Ireland, Galician Spain and Scotland, as well as traditional Irish tunes during the Barnes & Hampton Celtic Consort at Castleton Theatre 4 p.m. Sunday, Dec. 20.